EU transport emissions have risen by 36% since 1990 and are now responsible for 26% of Europe’s total greenhouse gas emissions – reducing these emissions is a critical EU target. The use of Bioethanol in transport fuel has the potential to significantly reduce global emission levels and mitigate the rapid rate of climate change. 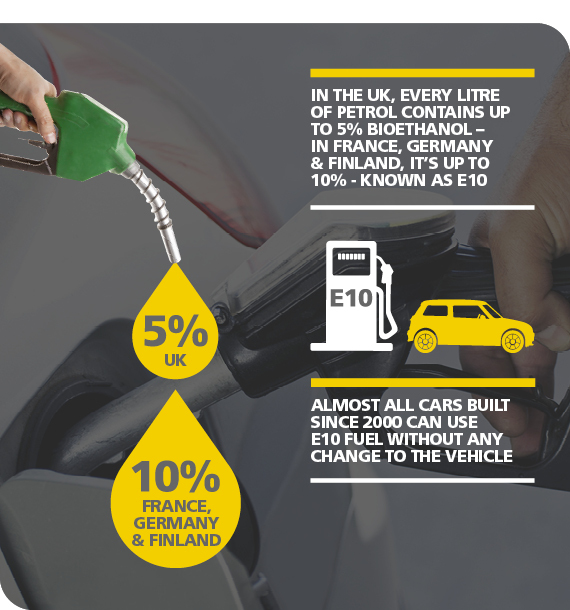 E10 is a blend used in many countries worldwide, which incorporates 10% ethanol blended with petrol. Almost all cars built since 2000 can use E10 fuel without any changes to the vehicle and it has been proven to work, with blends of E10 having been used for years in USA, Australia, New Zealand and Brazil. Some European countries already have E10 widely available including France, Germany and Finland. 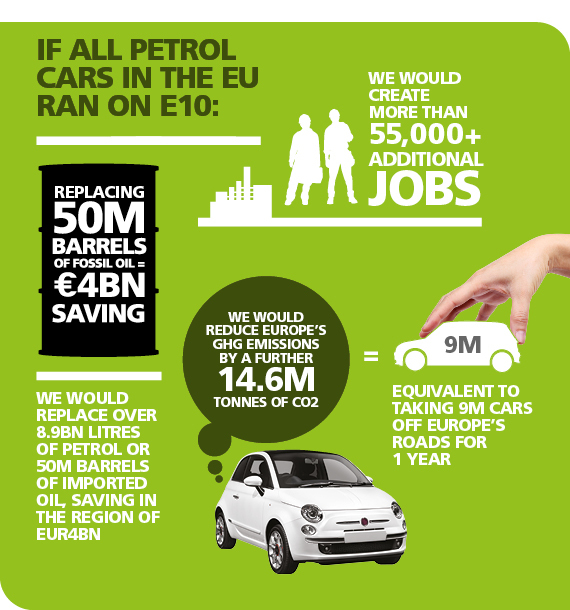 To put the savings into context, a switch to E10 from existing blends would be the equivalent to taking 700,000 cars off the road. Other alternative transport fuels such as electricity are limited in their potential due to the levels of supply needed and the fact that they would require significant changes/investment in infrastructure and also rely on a shift in consumer behaviour.